The second day of the trip is going to end, after a wonderful sail close to the Corsica West coast in the Pelagos Sanctuary for Mediterranean Marine Mammals, we get an unexpected even if hoped “rendezvous”. We were tired, but our friends from EcoMarine Malta told us to stay on alert especially in this area. Hey… Yes, there is something looming in the waves just a short distance from us. We get closer, it’s bigger than our 38 feet Dufour 382GL that we’re taking to Malta on behalf of MaltaCharters. 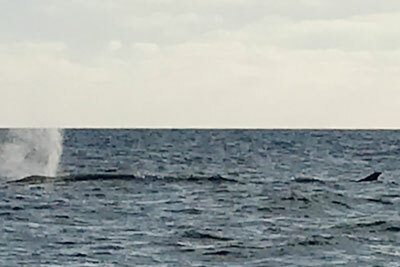 A Fin whale and its calf, which are running our same route. The emotion of detecting their powerful breath give us a sense of peace, the tiredness of the day flies away in a moment and we can take a quick picture from the second boat the Dufour 460GL that allows us greater stability ‘and security in approaching with caution and due distance to these majestic animals. We follow the Accobams Code of good conduct to approach them, according to the instructions of Patrizia, our trusted marine biologist. We leave them without crossing their route, hoping to observe other cetaceans on our way to Malta. In this amazing Sea, the Mediterranean Sea. The Fin Whale (Balaenoptera phisalus) is the only Mysticete that usually lives in the Mediterranean Sea. It is the second largest animal in the world after the blue whale. It can reach 24 meters in length with a maximum weight of 70 tons. It feeds mainly on zooplankton and in particular on Meganyctiphanes Norvegica. After years of research conducted by the Tethys Institute we know that the whales of the Mediterranean Sea belong to a population genetically separated from those of the Atlantic Ocean, so we have Our Mediterranean whale. This is extraordinary and fantastic. Movements of two whales in the Mediterranean Sea followed through satellite telemetry. Do you want to sail with us searching for Marine Life? always accompanied with an expert Marine Biologist. From April to October we organize Sailing boat and motor boat tours in Maltese waters spotting Marine lifes, contact us for more info. book now your summer experience. Flat sea.. but not so bad.